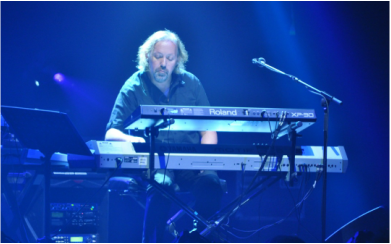 When my dad and Ian were involved with the UK theatre show “Come Together – A Tribute To John Lennon” back in 2005, Rick Benbow was the keyboardist and the 3 of them kept working together on various projects long after the tour was finished. Rick was involved with my dad’s children’s musical he wrote in 2006 and also with the Original Nursery Rhyme Recordings, starting in 2008. After a bit of a gap their first common project since the Nursery Rhyme recording was my album Chi Might! Rick contributed to four album tracks: Innocent, Doing The Wrong Thing The Right Way, IV, and Honeydrip. After the album launch in 2016, my dad, Rick and I teamed up to found ‘YourSoundTube’. So most of our Cover Collaborations were done by the three of us plus guests, like Andrei Cerbu on guitar or Juna Serita on Bass. He also arranged the strings section for the last Status Quo album AQuostic and got a golden record. How is it possible that a guy like that is involved in my project? Hm, good question. 10 years ago Rick and my dad have toured the UK playing in the same band. They are still working together on common recordings, so here we go! Starting my musical education at 4 with piano lessons, I joined several choirs and became Head Chorister at Gloucester Cathedral. At the King’s School I studied oboe and organ before moving to Cambridge to study music and composition. From then in I have divided my time between teaching, performing, arranging, composing and MDing. I studied piano with Grace Nunan, Organ with Gillian Weir, Andrew Millington, Richard Latham and John Sanders, Oboe with Barbara Currer-Briggs, Composition/Orchestration with John Tavener, John Rutter, David Nicholls and Robin Holloway.